Most people would agree that a collector has some degree of emotional attachment to the objects they amass – sometimes even a deep-psychological reason for accumulating things. Unfortunately, when we hear about a collector or see their prized possessions, we tend to focus on the rarity and value of the items. The reasons for collecting get lost in the glitz and glamour of the objects. Do you know why Peggy Guggenheim collected modern art? Or how Guido Mondani got hooked on collecting Rolex watches? Shedding some light on what compels a person to collect something – what truly fascinates them and what deep-seated feelings they hold – can enhance an outsider’s understanding of a particular genre or nuance and spark an appreciation for why something is special and worth collecting. When it comes to watches, F.P. Journe is the brand that John is most-passionate about. F.P. Journe is an independent manufacture recognizable to most casual watch fans by their unique dials and beautiful movements that power impressive functions. John loves what he sees on the front and the back, but to him, it’s really what’s on the inside that counts - and it all starts with the namesake – François-Paul Journe. John has developed a sort of metaphysical connection with Journe’s psyche and personality. His admiration for Mr. Journe’s vision inspired him to learn how his timepieces work – both theoretically and technically. John proudly owns several F.P. Journe watches. Each is a testament to his belief in and support of their founder. Before John laid eyes on an F.P. Journe dial – and his opinion on watches was forever changed – his curiosity about mechanical timepieces was sparked by Audemars Piguet’s Millenary Tradition d’Excellence Cabinet No. 5. This oval-shaped watch, with plateaued registers displayed its escapement from the dial side. This visual stimulus got him wondering: How do watches function? Accepting things as fact is not in John’s nature; he has an insatiable desire to understand for himself. To find out what other watches might peak his interest, he bought a copy of Wristwatch Annual - it quickly became his "encyclopedia" on watches. It was on the pages of this resource that he first encountered the artistry of the “different” dial layouts of F.P. Journe. Part of John’s DNA is a need to “know everything” about the subjects he’s “really into.” John had to look no further than F.P. Journe when choosing a ‘mentor’ to teach him about watches. Studying F.P. Journe is akin to getting your doctorate in a field. John recently stepped-away from a career in finance to pursue his Ph.D. in Finance. Journe’s watches offer one of the most comprehensive curriculums on horology: Researching the complications alone expound on horology’s past and show the promise of watchmaking’s future. What’s made the learning so enriching for John is that the professor – François-Paul Journe – still runs his company and is highly-involved in the industry. The two examples John chose to share pay homage to groundbreaking feats that launched F.P. Journe. As John became familiar with the first two production models – the Tourbillon Souveraine and the Chronomètre à Résonance – he gained insight into the mindset of François-Paul Journe: John read and heard stories alluding to Journe’s perfectionist tendencies, his penchant for problem-solving, and his technical aptitude. These character traits resonate with John: He confesses to possessing a measure of each in his own makeup. Collecting F.P. Journe watches is a natural byproduct of the kinship he feels towards Journe. 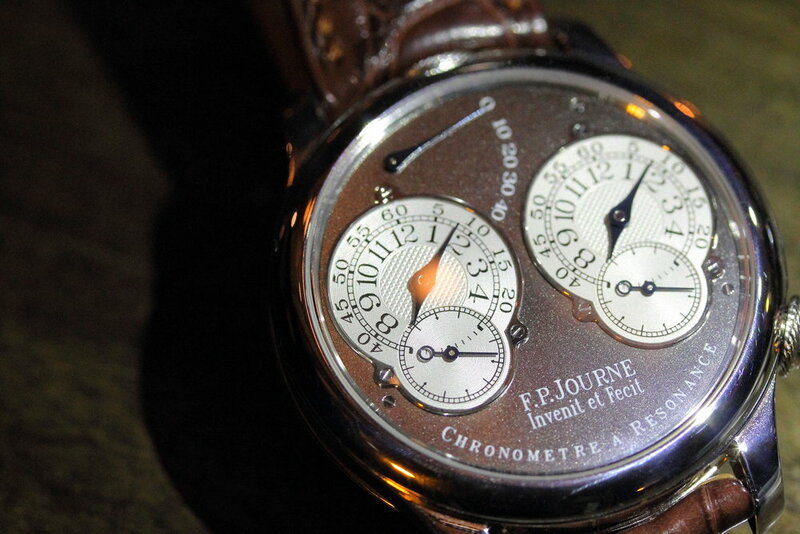 François-Paul Journe was obsessed – to put it mildly – with executing a tourbillon. He spent night and day - every waking second of his early twenties – trying to get it right. Eventually his persistence paid off. When it came time to launch his brand in 1999, his first ‘production’ watch contained a tourbillon. This device rotates the escapement to counter the effects of gravity on the balance; yielding greater accuracy. However, in classic Journe fashion, he wanted his inaugural watch to be even more precise. So, he coupled his tourbillon with an additional mechanism - a remontoir. This mechanism stores the energy from the mainspring and disperses it more evenly (i.e. constant force) to the escapement; essentially improving on the accuracy of a tourbillon. The perception of a tourbillon today is much different than it was twenty-plus years ago: The first word that comes to mind – for most watch admirers – is “expensive." When John speaks about a tourbillon, that word is not in his vocabulary. He, like Journe, loves what a tourbillon does more than what it means to society. When you lock eyes with the symmetrical, Venn diagram-like sub dials of the Chronomètre à Résonance, you simply think it’s a creative way to display dual time zones. By now you should know it’s never that simple with F.P. Journe. The layout is much more than meets the eye: It’s the acclaimed result of years of painstaking trial-and-error attempts to scale-down a rare function found in only a handful of regulators and pocket watches built by legendary watchmakers Antide Janvier and Abraham-Louis Breguet. Named after the theory underlying those timing instruments’ superior performance – Résonance is the concept that two contra-rotating independent balance wheels placed incredibly close together synchronize each other through their vibrations. By working together (i.e. resonance) the two movements’ precision – with respect to each other – varies no more than tenths of a second per day. John’s Chronomètre à Résonance is a limited-edition example made in 2005 to commemorate the 2nd anniversary of the first F.P. Journe boutique (Tokyo). John has tremendous admiration for this design because it speaks to Journe’s problem-solving, never-give-up mentality. In addition, it’s also a ‘living and breathing’ tribute to watchmaking luminaries and scientific breakthroughs. The reverence John has for this particular watch’s capability prompts him to use the time zone function a bit differently than one would expect: John prefers to always have the times set the same. 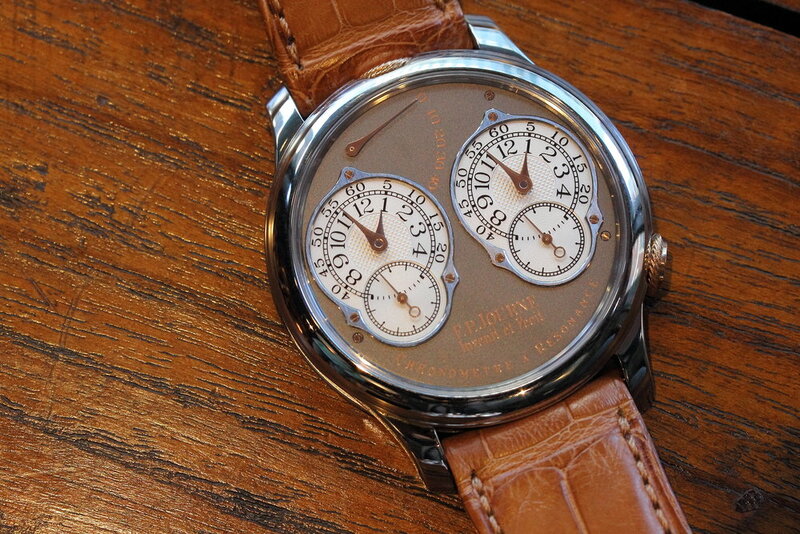 Showing the harmony of the movements is his way of honoring Journe’s achievement. John is truly an ambassador for F.P. Journe. He takes immense pride showing and explaining his collection to anyone who asks. From knowing the quirks of François-Paul Journe – he personally selects a signature fragrance for each of his boutiques – to visiting Journe’s workshop in Geneva, John’s relationship with F.P. Journe watches goes way beyond the superficial and is a perfect example of what’s at the heart of collecting. The photography accompanying this story was taken at Golden Triangle- a home furnishings destination for rare Asian and European antiques located in Chicago, IL.